The Fund for Assistance to the Russian Orthodox Church Outside of Russia welcomes back the fund’s former treasurer – Alexander Kulesha, who had provided expert service to FFA for 13 years before retiring in 2007. Mr. Kulesha holds a Bachelor’s degree in Mechanical Engineering from City College of New York and a Master’s degree in Business from Fairleigh Dickinson University. as treasurer of the Synod of Bishops Bible Fund; and as treasurer of the Orthodox Palestine Society, U.S.A., Inc., where he continues to serve. 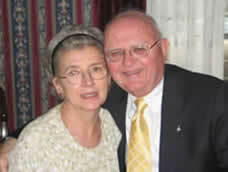 Mr. Kulesha has two sons and five granddaughters and resides in NY with his wife Irina.